Mexico had a problem with illegal voting (the dead voted there just as they do in Chicago today) and they arrived at a solution. They issue a national identification card in the form of a voter credential. Q - LL can you get a legitimate voter card yourself even though you aren't a Mexican citizen. A - Yes, but it's not easy. 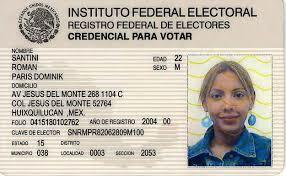 You need a voter ID card to obtain a passport in Mexico. So the pathway to "legitimate citizenship" under an assumed name in Mexico is through a voting card. I would never collect legitimate identification documents from a nation not my own, but knowing how to do it is part of tradecraft. Having made that admission, you must appear in person to vote in Mexico, presenting your voter ID card, which is physically punched. You must vote at least once every seven years, or the card becomes invalid. Given that the current pattern of electing Democrats is that massive numbers of ballots are "found" as if by act of God to tip the numbers, they won't be interested in instating something like a voter ID card (which is a national ID card in Mexico). Given that natural resistance, the only way that we will have legitimate election results in the US is to abandon on-line, absentee and other mail-in ballots and use the Mexican system to insure an honest election. To obtain a voting card in Mexico, you must verify citizenship in person, be fingerprinted, and photographed. Even using the above mentioned tradecraft, a personal appearance with metrics is required. I'm sure that the Chicago Machine will be able to exhume the bodies of the dead and roll prints from their shriveled carcasses, but it will be more challenging than the current system (impossibly corrupt and broken) seems to be.